Our events team, comprised of our gourmet catering partner, their staff, and our event experts, work with a select group of vendors, selected from the best in the business, to create a wedding or private event that will exceed your expectations. We strive to make a flawless event easy; accomplishing this by working with only top talent and those we can trust. We offer complete packages taking care of all details to create your event. Everything you need is here at your fingertips to create a magnificent and memorable lifetime experience, lasting for years to come. Take the first step towards creating your wedding or private event vision by contacting us today. We can schedule your appointment, as well as answer any initial questions. In your tour of Priam Vineyards, we'll take you through the details of our package, and ways to customize it to work for your budget. You will also taste our world class wines, starting the creation of your dream wedding or event. Our world class wines, picturesque hilltop site, and natural beauty of the vineyards and winery are ideal for a unique and beautiful event. The magnificent, natural environment will enhance any wedding vision and our winery is a perfect location for any private or corporate event. It’s a place where you can truly unplug from everyday life to focus on and enjoy the people in your life that are invaluable. Our customized wedding packages help to ensure that we make your vision come to life. With our catering partner, Gourmet Galley, we offer high quality food, wine, and bar options for you and your guests to enjoy. Our Gourmet Galley Catering Package Includes: Wedding Coordination ­ 5 Hour Wedding Reception ­ 5 Hour Premium Open Bar ­ 6 Passed Hors D ’Oeuvres and Seasonal Harvest Table ­ Personal Attendant for the Wedding Couple ­ Champagne Toast ­ Service & Bar Staff ­ Tableside Wine Service throughout Dinner ­ Plated Dinner or Dinner Buffet * ­ Single Tier Cutting Cake & Mini Desserts with Coffee/Tea service ­ Large Color Selection of Table Linens and Napkins, along with our wedding package China, Flatware and Stemware ­ Menu Tasting ­ Complimentary for Bride & Groom * Custom menus available, please inquire with catering. Our Priam Vineyards Complete Site Package Includes: Bluebird Pasture (Reception) Our breathtaking site for weddings with a magnificent 35 mile view. ­ Reception Tent (48' x 135', 6500 SF) with Cook Tent (30' x 60', 1800 SF) Tents are heated when needed, have perimeter & canopy lighting, and carpeted flooring. ­ Tables & Chairs for Wedding Reception* 10­12 person 72" round tables, white wooden vinyl seat folding chairs, 3 low top & high top cocktail tables. ­ Wine Barrels­ Six total ­ Dance Floor ­ 500 square feet ­ Luxury Portable Restrooms & ADA Handicap Unit Our air conditioned Portable Restroom Trailer throughout your event. Additional portable handicap unit. ­ Winemaker's Loft Bridal Suite Our private suite for you and your bridal party to use 2 hours prior to ceremony start. ­ 5 Hour Wedding Reception ­ Parking Attendants One parking attendant per 50 guests is a general rule of thumb. ­ Use of the Venue for your Engagement Photos ADDITIONAL Required ­ Wine Package ­ Priam Vineyards Wine Selections by the Bottle ONE bottle per FIVE guests is required. ADDITIONAL Optional ­ Ceremony ­ Wedding Rehearsal & Ceremony on Site Rehearsal, ceremony coordinator & white wooden folding chairs for your guests. Adds one hour to your reception time. 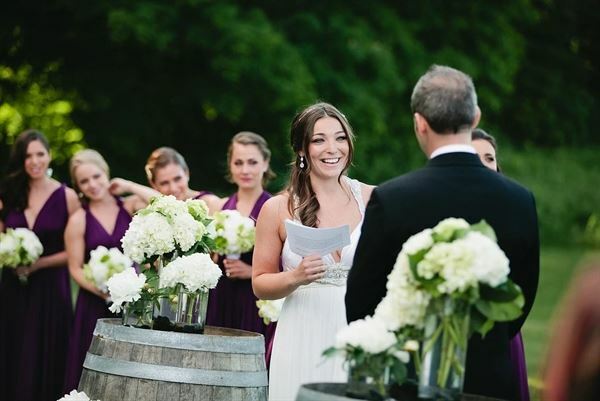 Ceremony site is a classic New England stone wall lined with Sugar Maples and a magnificent view of the valley & vineyards. Our smaller private events and corporate events happen in our new beautiful private space built in our winery. Priam Vineyards with our catering partner, Gourmet Galley, are able to provide your group with high quality food, wine, and bar options for you and your guests to enjoy.